Research papers on special education services discuss the services that usually includes modified instruction, smaller classroom setting, and adapted materials. It may take time for some students to be identified as qualifying for special educations services. Other students who go to school with preexisting diagnosed medical conditions may immediately qualify for special education services. Some of these medical conditions include brain damage, developmental disorders, intellectual disabilities, mobility concerns, or visual or hearing impairment. For the students who do not come with preexisting medical diagnosis, the process can take months or years. Most school systems have moved to a response to intervention model for identifying students. Students, who are identified as needing services, receive an Individualized Education Plan or IEP. The IEP is a legally binding document that sets goals and a plan for the support a student needs. According to the Individuals with Disabilities Education Act, all schools must provide free public education to all students from ages 3-22, even students with disabilities. School and school system funding is tied to compliance with this law. Once a student has been identified and has an IEP, they will work with a teacher in a small group for more individualized instruction. Accommodations may be made to help the student make progress and feel successful. The goal of most special education programs is to teach a student in the least restrictive environment. This means that when possible, a student will receive instruction in core subjects in their regular education classroom and either receive pull out instruction during other times in the day or have a Special Education Teacher in the general education class with him/her. Special Education Policy research papers discuss the policy that enabled all children, regardless of their mental, physical, or emotional disabilities, access to free and suitable education. Mainstreaming Research Papers examine one of the most controversial and complex issues in the education field. Hearing Impaired Education research papers discuss the challenges teachers face when when teaching children with hearing disabilities and the many techniques that should be implemented in their education. Inclusion in the Classroom - The acceptance of inclusion within the classroom can have identifiable effects on both the educational options available to disabled children as well as the experience of the regular classroom instructor. Inclusion and Education research papers discuss how some public and private educational institutions to include or incorporate students that suffer from disabilities or special needs within a traditional classroom environment. Teaching the Visually Impaired research papers discuss what accommodations are used to teach visually impaired children in the classroom. Learning Disabilities Research Papers delve into this disorder and the steps they are taking to help these children. Special Education Strategies - Special education strategies are necessary for the success of these students, and require flexibility and persistence on the part of the teacher. Deaf Education - This research project discusses several Approaches to Deaf Communication. Deaf education theories will be examined. Disability Rights - Disability Rights research papers on the movement in the United States that has created an environment that is free from discrimination for individuals with physical and/or mental disabilities. Education for All Handicapped Children Act - Education for All Handicapped Children Act research papers explain the act that was passed by Congress that allowed federal government money to provide equal access to education. 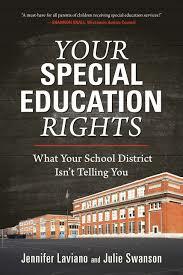 History of Special Education - Prior to the 1970’s, a number of parent-organized advocacy groups formed grass-root movements in order to promote the education of children with special needs and to protect them against discrimination inside and outside of the classroom. Nonverbal Learning Disorder - Nonverbal Learning Disorder research papers look into the neurological disorder that displays a significant discrepancy between higher verbal skills and the lower skills. Paper Masters writes custom research papers on special education services and discuss the services that usually includes modified instruction, smaller classroom setting, and adapted materials.